–Kateri, lover of the Cross of Jesus, pray for us. –Kateri, lily of purity, pray for us. –Kateri, consoler of the Heart of Jesus, pray for us. –Kateri, example to your people in all virtues, pray for us. –Love for Mary, pray for us. –Kateri, flower of fortitude for the persecuted, pray for us. –Kateri, full of patience in suffering, pray for us. –Kateri, steadfast in all prayer, pray for us. –Kateri, keeper of your virginity in persecutions, pray for us. –Kateri, courage of the afflicted, pray for us. –Kateri, unshakeable in temptations, pray for us. –Kateri, who traveled many miles to learn the faith, pray for us. –Kateri, lover of penance, pray for us. –Kateri, who loved Jesus in the Blessed Sacrament, pray for us. –Kateri, who by your love of humility gave joy to the angels, pray for us. –Kateri, humble servant to the sick, pray for us. –Kateri, bright light of all Indians, pray for us. –Kateri, whose scarred face in life became beautiful after death, pray for us. Saint Kateri Tekakwitha was beatified on June 22, 1980 by Pope John Paul II and canonized October 21, 2012 by Pope Benedict XVI. 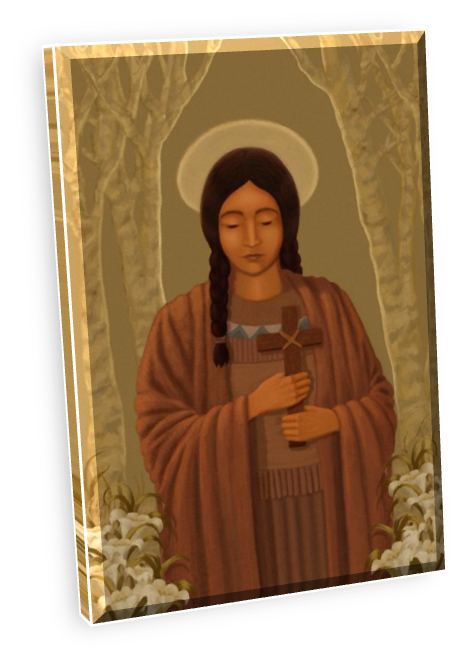 Saint Kateri spent most of her young life in upstate New York near Auriesville, in a town called Fonda. After having been inspired by Jesuit missionaries, Kateri asked to be baptized and her desire for baptism was granted when she was 20 years old. She was baptized on Easter Sunday in 1676 and was named for Saint Catherine of Siena. 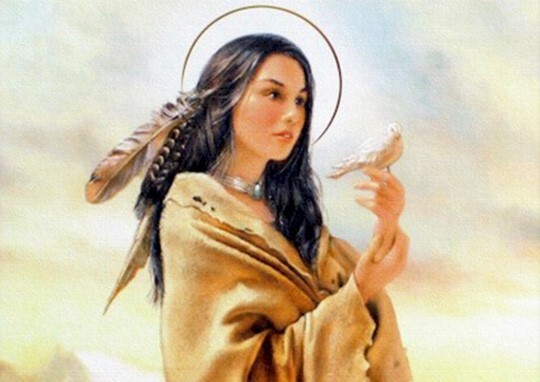 On March 25th, 1679, Saint Kateri, at the age of 23, took a vow of perpetual virginity. Saint Kateri’s father was a Mohawk Chief and her mother was a Catholic Algonquin. When Kateri was about 4 years old, her village was ravaged by a small-pox epidemic which took the lives of her parents and her little brother and left Kateri with a scarred face and partially blind. She was adopted by two aunts and an uncle who, like her father, was a Mohawk Chief. Young Kateri often sought the solitude of the woods and forests to pray and to listen to the voice of God. Because this took her away from her work and because she was so different from other Indian maidens, she was treated badly, and was often refused food on Sundays because she would not work on that holy day. Kateri bore all her sufferings with patience and even joy because she was drawn to imitate her crucified Spouse, Jesus. She was threatened with torture or death to get her to renounce her new faith, but she would not deny her Lord Jesus. It is said that Kateri often asked: “Who can tell me what is most pleasing to God that I may do it?” Much has been said about Saint Kateri’s extreme acts of penance and physical mortifications, but we know that she was also a young woman filled with holy joy, a gentle maiden who taught the children in her village and who helped the poor and the sick when they were in need. When her family and others urged Kateri to marry, she would say that she had Jesus as her only Spouse. Kateri was forced to leave Fonda and travel a hard and long path to Canada where she was able to live her faith in peace. Saint Kateri was canonized on October 21st as the first Native American Saint. It has been said that Saint Kateri is a bridge of healing and reconciliation for our contemporary world and our Church and was an instrument in her lifetime of the First Evangelization and a model now of the New Evangelization for the Church. She was named by Pope John Paul II as a patroness of World Youth Day in 2002. Saint Kateri died on Wednesday of Holy Week, April 17, 1680 and her final words were: “Iesos konoronkwa – Jesus, I love You.” Although Saint Kateri’s face had been terribly scarred by smallpox, after her death the scars disappeared and those who saw her said that she looked incredibly beautiful and serene. All Saint Kateri had done throughout her young life, she did with great love and humility and perfect joy. Her relics are in a sealed marble tomb at St. Francis Xavier Mission at Kahnawake, near Montreal, Canada.